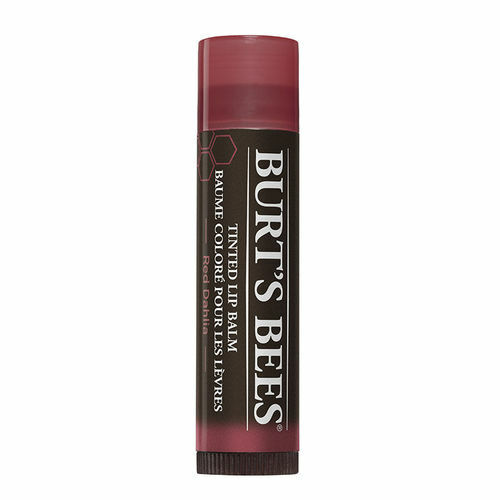 Burt's Bees Tinted Lip Balm is 100% natural and contains nourishing ingredients like shea butter and botanical waxes. Ingredients: Cocos nucifera (Coconut) Oil, Olus (Vegetable Oil, Huile Vegetable), Cera Alba (Beeswax, Cire D'abeille), Olea europaea (Olive) Fruit Oil, Candelilla Cera (Euphorbia cerifera Wax, Cire De Candelilla), Helianthus annuus (Sunflower) Seed Oil, Aroma (Flavor)*, Lanolin, Butyrospermum parkii (Shea) Butter, Ricinus communis (Castor) Seed Oil, Cananga odorata Flower Wax, Jasminum officinale (Jasmine) Flower Wax, Ammonium glycyrrhizinate, Tocopherol, Rosmarinus officinalis (Rosemary) Leaf Extract, Glycine Soja (Soybean) Oil, Canola Oil (Huile De Colza). May Contain: Alumina, CI 77891 (Titanium Dioxide), CI 75470 (Carmine), CI 77491, CI 77492, CI 77499 (Iron Oxides). *Natural Flavor. Recommended Use: Sheer, natural shades that go on so flatteringly, you don't even need a mirror. Go ahead, apply anytime, anywhere. The customer reviews posted below are based on individual consumer experiences and may NOT necessarily represent what expected results will be from using or taking Burt's Bees Tinted Lip Balm Red - Red Dahlia - .15 oz. These results may not be typical and you should not necessarily expect to receive the same results. Actual results may vary. Well nourishes and gives a beautiful wine shade. These tinted lip balms are great when i dont feel like wearing lip stick. It has the same moisturizing effect that the other burts bees balms have but with a subtle tint. It doesnt look like lipstick, just a darker shade of the lips thats really pretty.